This past few weeks has been all about connections for me - and they (the past few weeks, that is) have been pretty well a blur too! First off being a connected educator has been the theme over the first few weeks of the course I teach here at BU's Faculty of Education called 03.467, Internet for Educators (#I4Ed is our twitter hashtag devised by one of my students). I have also decided to TRY to take part , as much as I can in a very packed term, in #etmooc, which has Connected Learning as one of the first topics - and is in fact the nature of the course. Fortunately, since this is the 'stuff' I teach - the tools and methods of connecting are, for the most part, not new to me. I must digress to say that I am getting a new view of Google +. 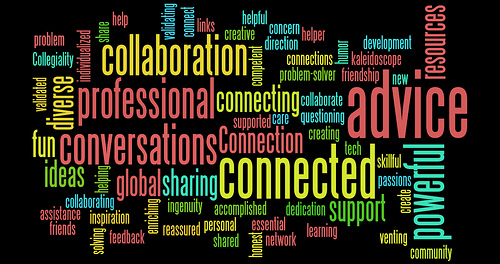 I never really paid much attention too it, but connecting with more people on it and the use of the communities feature is giving me renewed enthusiasm about it - and thinking of ways to use it in my teaching and future research projects. I have been fortunate and honoured to have three amazing speakers present to my class over the past few weeks to talk about the topic of PLNs and connectedness. John Evans (@joevans, MB Education) came out to share his experience as a former teacher and principal to talk about PLN's and MAPLE (a soon to be released network for all Manitoba teachers). Then Dean Shareski (@shareski) skyped in to present his lessons about being a networked educator, and finally Dr. Alec Couros (@courosa) popped in via Adobe Connect to share his wisdom (this almost right after he presented to etmooc folks!). It is interesting to note that I really got to know this educators through online means (mainly twitter) before I met them in person (to be honest, I did meet Alec briefly when I was in the process of applying to the U of R Ph.D. program - I decided, however, to attend U of Manitoba instead). I like sharing how I have met some incredible people online and that these relationships are every bit as real as the face to face ones (but the 'separation' of online & physical spaces is a topic for another post). Having these various points of view coming into my class spurs great thinking about teaching on my student's blogs (here is a list of their blogs if interested). 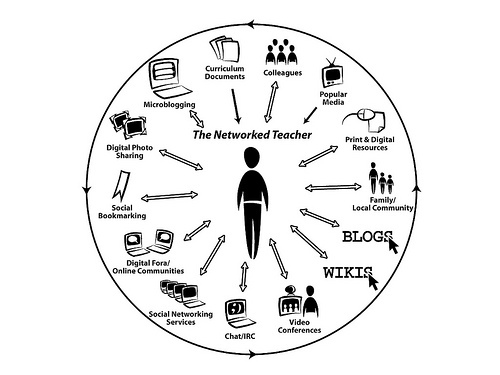 One of the tasks I asked my class to do was to consider their connections as educators and to map them out (using Alec's famous diagram shown on the right) as a guide. I also asked them to consider the connections that their students have - and how these connections might impact on their own classrooms. I will share some of these diagrams. One of the first ones in was by Tyler and is pretty remarkable, and here is the next, by Kirsten (btw, Tyler and Kirsten - are taking etmooc with me - we did our lip dub line together - it is enjoyable to have these two along, and now another student, Lisa joined up). If you wish to see more of these visualizations, check out some of their blogs - which I mentioned in the previous paragraph (I made one of these for myself a few years ago and need to reconsider it). 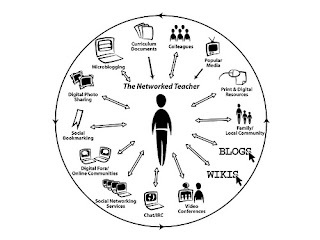 I find this an interesting assignment; reflecting on our connections gives an appreciation of the breadth and depth of our connections and how they contribute to our learning. Considering how our students connect gives us insight into their worlds and how we can use the information in our teaching. I really enjoy following the thinking that goes on as my students and I try to make sense of the implications connected learning has for their future careers as teachers. And, these people will be amazing teachers, so if you are a school Principal, start signing them up. Thanks for the shout out Mr. Nantais! I completely agree about meeting people via Twitter before meeting them in "real life". I am looking forward to meeting people at BYTE after connecting via Twitter for so long.